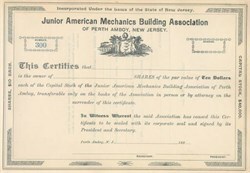 Beautifully engraved unissued Certificate from the Junior American Mechanics Building Association dated 189_. This historic document has an ornate border around it with a vignette of two allegoric women holding a coat of arms in front a train. This item is from Perth Ambory, New Jersey.